INDIANAPOLIS – The must-have souvenir from the first few days of Super Bowl week is not a team jersey or a miniature helmet. And it is not for sale, although one person has offered $200 for one and players and team executives have clamored to get them for themselves and their wives. It is a humble, hand-knitted scarf, originally intended to keep warm – and make noticeable — the 8,000 local volunteers who are the backbone of any Super Bowl week. And then there’s Olympknits. Self-described as “quirky” (with which I heartily agree! ), the site features a video of knitted athletes, complete with a wardrobe malfunction. In addition to the usual track and field, swimming and gymnastic events, the knitted competitors participate in rowing, synchronized swimming, equestrian events and fencing. You can purchase patterns to knit your own athletes, but registered members can download different free patterns every month! When I found out that Ed the Equestrian and Harry the Horse were one of the options for this month, I signed up in a heartbeat. Now, lest you think that it’s all just silliness, they have a caption contest, and the winner will get 2 nights in a luxury London hotel! THAT, I would sign up for in less than a heartbeat… but there is no mention of travel expenses, so I’m out of luck all around. 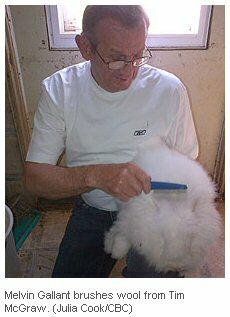 A couple on Prince Edward Island have come up with a new twist on promoting Angora rabbits and fiber. Deciding that their region didn’t have enough interesting activities for tourists, they are opening their rabbit barn for 2-hour rabbit-brushing and Angora-spinning visits! The rabbits, all named for country music singers, are apparently on board with the plan. They said they wanted to do something different, and by golly, I think they’ve found it!